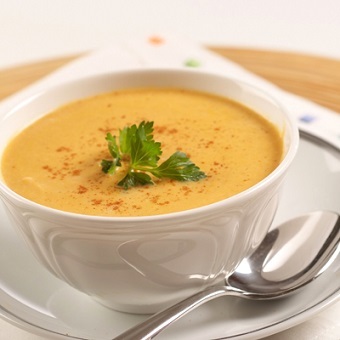 These Soup Recipes will give you delicious, nutritious soups you and your family will love. Each soup is a favorite restaurant recipe. With some delicious bread, a really good soup can be a "stand alone" meal or an appreciated part of a meal. Once made, a nutritious and delicious soup might easily provide several meals. 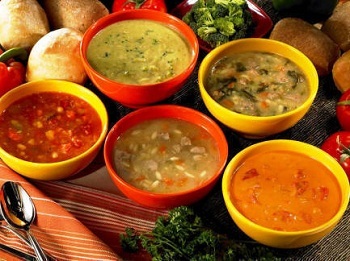 Most of these restaurant recipes for soup are easily re-heated to serve later without a loss in taste or nutrients. Note: Some soups require a thickening agent or mixture called a "roux." You can access a roux recipe and more information about making a roux from those specific recipes or by clicking on Make A Roux. This is a “quick and easy” winner. It’s a great soup with lots of flavor but the recipe uses canned bean and bacon soup as the “base.” A favorite for years. Preparation time: 15 minutes. 12 servings. Chili - Three Bean Enchilada Chili. Three times the flavor plus a secret ingredient that makes this a secret restaurant recipe! Preparation time: 30 minutes for preparing the sauce. Serves 6-8. The guests were surprised at the mild and creamy flavor of this soup. Preparation time: 15 minutes. Serves 4. A comfort food, especially on a cool fall or winter day. Preparation time: 10 minutes. Serves 6. This recipe calls for beef, but you can use pork, chicken or some game meats if you prefer. You can also leave meat out al-together. Preparation time: 30 minutes. Makes 8 generous portions. This Guinness Beef stew is an Irish pub favorite. Preparation time: 15-20 minutes. Serves 4-6. Does this soup recipe really stave off a cold or the flu? For some reason, other than the fabulous taste, the restaurant sells gallons and gallons of it during "the season.” Preparation time: 30 minutes. Serves 8. 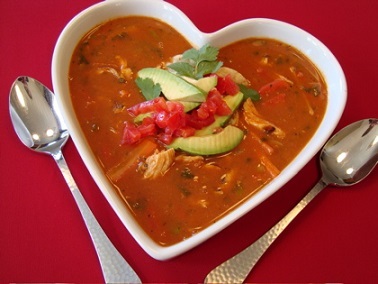 This hearty, nutritious chicken tortilla soup recipe is popular on warm spring days as well as cold winter nights. Preparation time: 30 minutes. Serves 8-10. There are many excellent recipes for various kinds of chili. This recipe is a "traditional" tasting chili. Preparation time: approximately 2 hours for cooking beans. Servings: 10-12. Good anytime of the year but very appropriate for an October get together. Preparation time: 15 minutes. Makes 16 servings. This clam chowder recipe with smoked salmon is so hugely popular with restaurant guests I serve it seven days a week and always sell out. The recipe "marries" two fabulous products, clams and smoked wild salmon with just the "right" herbs and spices to bring everything together in a "happy union." It is a famous restaurant recipe. Old-fashioned? The restaurant customers don’t think so, or ...they don’t care. It’s a winner as far as they are concerned. Preparation time: about 30 minutes. 12-15 servings. This soup recipe creates plenty of flavor and has great texture. It makes a wonderful meal when served with a bran muffin. Preparation time: about 60 minutes. Serves 8-10 eight ounce portions. One of the ways I keep the restaurant customers (and my husband) happy is to feature this soup at least several times a month. It is a favorite. Preparation Time: 40 minutes. Servings: 6. The modern version of this soup apparently originated in France in the 17th century. The onions were caramelized, added to beef stock and topped with dry bread (croutons) and cheese. Preparation time: 30 minutes. Serves 4. There is an old proverb that goes: "Good soup draws the chair to it". This recipe proves the point. Preparation time: about 40 minutes. Serves 10-12. I am delighted with the subtle blend of flavors in this soup. It is my personal favorite vegetable soup recipe. Preparation time: 30 minutes. Servings: 8. 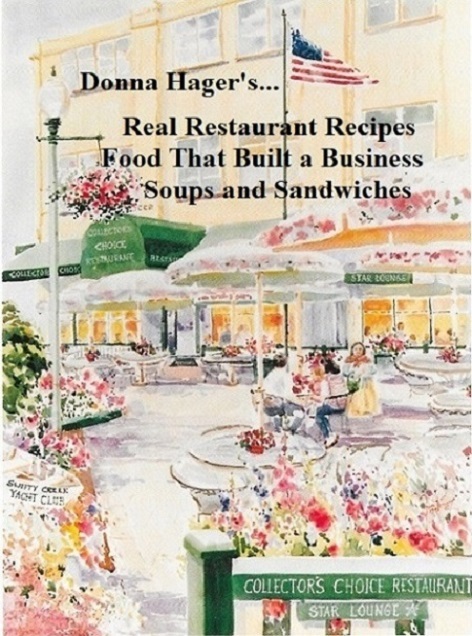 Thank you for your interest in recipes that allow you to cook with confidence and style! ENJOY your soup recipes and the company of those you share them with! And...these recipes are available in an e-cookbook or in a beautiful, full-color paperback!